We have a wide variety of approaches and initiatives all carrying the same ultimate prevention objective: reduce substance abuse. A prevention tool that creates a visual-simulation of the impairments created when consuming alcohol. Fatal Vision Goggles are used by Prevention Specialist staff in schools and regularly utilized by Coalition staff at community events and presentations. Alcohol is responsible for more than 4,300 annual deaths among underage youth. 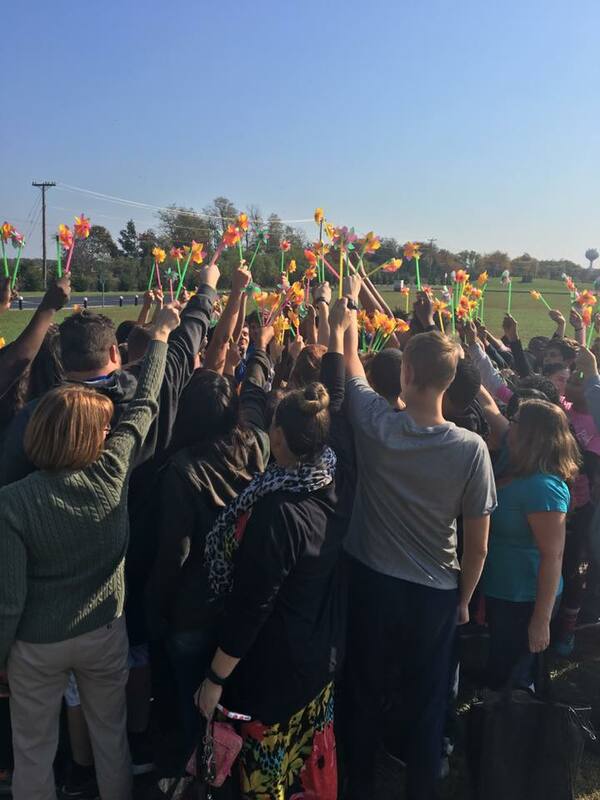 Hundreds of pinwheels are placed on school grounds representing underage youth who die each year due to alcohol. Especially around homecoming a prom times this is a powerful visual for students driving to and from school as they are challenged to celebrate well by staying sober! These event promote serving non-alcoholic “mocktails” at parties and family gatherings as a festive alternative to alcoholic beverages. This helps change attitudes and norms around drinking by showing that youth can have fun without alcohol. An underage drinking prevention initiative where students design postcard-sized advertisements that promote healthy after-prom activities and staying sober. The student with the winning tuxedo card receives a prize and their card is distributed to local businesses that serve prom-goers to be included with prom-related purchases. In collaboration with Inspira Health Network, we are distributing innovative drug deactivation pouches for in home rx disposal, keeping medications off the streets and out of our waterways . It is as simple as "just add water." Find out how to get your kit today! Most police departments in our area have safe disposal sites for you to get rid of your unwanted prescription pills. Remove the danger and clutter from your home today! 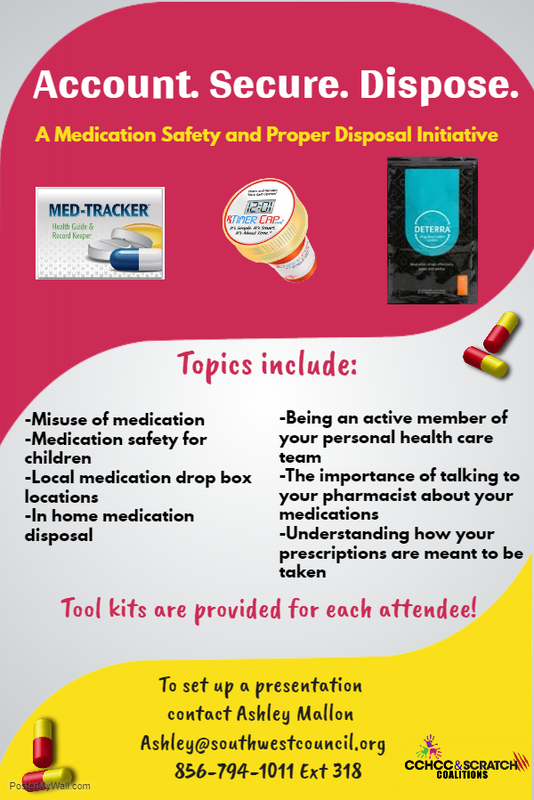 “Account, Secure, Dispose,” not only dives into the current drug problem, but then it offers tangible solutions for accounting of medications through med-trackers and securing them with prescription timer caps which act like a stopwatch whenever the lid is opened, and disposing through Deterra pouches which are environmentally friendly. The mobilization effort holds a dual focus: educating physicians and raising awareness among citizens and families. It is designed to bring attention of the prevalence of opioid abuse and steps they can take to halt the epidemic. student athletes and to provide evidence-based recommendations and information that will encourage and promote policy and practice changes that will strengthen schools, athletic departments and community based athletic programs. One in five teen drivers surveyed in a recent poll admit driving under the influence of marijuana. Marijuana use impacts judgement, motor coordination, and reaction time. This campaign focuses on educating students and drivers on the risks of driving impaired. Initiative aimed to equip educators and parents with knowledge about vaping and the ability to identify both the devices themselves and signs that youth may be using them. Efforts include access to adult cessation programs offered by trained clinicians to aids in efforts to stop smoking, and a growing collaborative of policy influencers and passionate community members to impact the age of sale in local communities. A youth leadership group dedicated to reducing substance abuse amount their peers. Students from Cumberland County with in-school chapters in Vineland, Millville, and Bridgeton meet regularly and conduct substance abuse prevention initiatives both in and out of school. Studies show that kids who regularly have dinner with their families are less likely to use drugs. Furthermore, studies also show that kids who know that their parents disapprove of drug use are less likely to use. We invite local establishments to spread the word by letting our members and youth groups come your business or organization to place the stickers on takeout containers, boxes, bags, etc. Program provided to schools that encourages high school students to think about the influences in their lives, identify which are positive and negative, and empowers students to choose which influences they will allow to affect them. Above The Influence utilizes classroom discussion and creative art projects for students to depict how they can stay above the influence. Contest that promotes protective factors by encouraging high school youth to write down positive New Year’s Resolutions that will be publicly displayed in their school. Writing plans down and making them public increases the odds that these positive resolutions will be kept. Need help knowing where to start when talking to your child about being drug free? Start here with this tips sheet for ideas and conversation starters. There are links at the bottom if you want to go deeper. By partnering with school systems across Cumberland, Gloucester, and Salem to administer PRIDE Surveys to students we are able to assess students’ attitudes, behaviors, and beliefs about marijuana, tobacco, alcohol, and prescription drugs. Giving us current local data on how our students are doing. We then share the data confidentiality with the partner schools and develop a prevention strategy to best meet their needs. Southwest Council staff has continued to support men and women in recovery and honor those who have passed away from the disease of addiction by participating in and promoting local Recovery Walks.